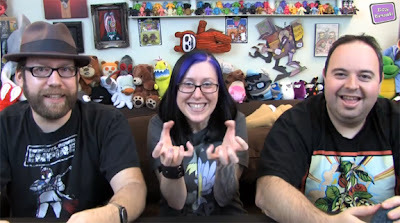 Triplikid: Triplikid's Groper on "Toy Break"
In this week's episode of Toy Break, they went over a bunch of new toys including our very own Groper! I had the pleasure of meeting George and Ayleen back in October at NYCC. They were both extremely nice to speak with and I only wish I could have chatted with them longer. They gave us a great review, and touched on so many points that this character was designed around. A lot of thought went into how this character was constructed. As a CG Animator, my day to day is spent in a 3d world. I wanted to bring that same aesthetic and appeal to my little guy. The Fur, the stance and balance, down to the relief in the mouth and adding dentures as a solution were all things that were carefully discussed and I feel came out perfectly. Great eye for them to pick up on this stuff, and I am very glad they noticed. It made the entire process that much more rewarding. Be sure to check out the episode here TOY BREAK. **The segment on Groper starts at about 22 minutes in.